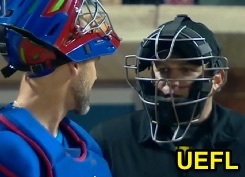 After taking a deflected pitch in the facemask, HP Umpire Clint Fagan remained in Wednesday's Cubs-Mets game. With none out and none on in the 6th inning, Mets batter Lucas Duda took a first-pitch cutter from Cubs pitcher Jonathan Lester for a ball. As catcher David Ross attempted to glove the 87 mph offering, the baseball deflected off the upper part of his mitt and hit Fagan right between the two horizontal orbital "eye bars" of his traditional-style mask, which appears to be the Wilson Titanium model worn by a handful of other umpires throughout the league. After attention from Mets training staff and discussion with other umpires, Fagan remained in the game. This was the same Cubs-Mets game that inspired our most recent rundown-centric Case Play.